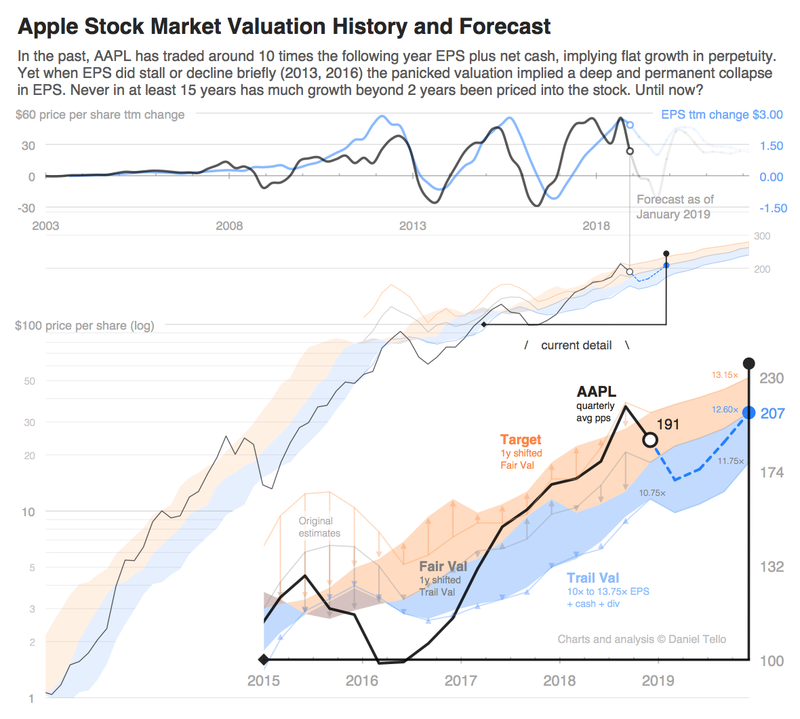 As of yesterday's close of $150.00, AAPL is trading at a 11.6x multiple on my next-twelve-months EPS estimate (10.4x when excluding next-12-months net cash and dividends). Analysts are modeling insufficient buybacks, or don't believe in net cash zero promises from management, or still hope for big M/A. Implies ~8% upside to consensus EPS estimates. My prior forward valuation multiple expansion of 0.25x per quarter will gradually taper starting after current quarter from 12x to 13.5x by 2022. Should be aiming at 15x but need to accomodate market sentiment in order to model future share reduction more accurately. Always appreciate your in-depth analysis, and thanks for your great work. Anon, thanks for catching that. Also corrected the valuation periods’ starting months from Oct to Jan.
Volker H, thanks for those kind words, glad you find my work useful. I agree dividends should rise at a much steadier pace than earnings, but I don’t have them completely unilinked. I think I give a small weight to the trailing 3y rate of earnings growth, and a much heavier weight to the trailing 3y rate of dividends growth, but capped at something like a 30-35% payout ratio. The buybacks being much more discretional, I find it convenient that this (granted quite arbitrary) formula allows for intensifying the buybacks during periods of slow or negative earnings growth, likely when the stock price would be depressed, thus making the buybacks more effective, and then the dividends would lag by a year or 2. This also saves on dividend costs, since the larger raise later is paid to a smaller shareholder base, and it also results in a more stable yield rate. But most likely all this fudging with the model is trying to be too clever, and a steady 15% raise while cash remains in excess would be just as good. The effect on valuation is likely small. Volker, to clarify: the lag effect on per share dividend raises after more intense buybacks happens because those raises are modeled in part by (although with a smaller weight) the trailing 3y rate of EPS growth, and EPS is boosted by the buybacks in a lagged manner due to share reduction. To be more precise, periods of slower EPS growth (probably flat to negative net income growth) would be anticipated by the forward-looking valuation model, so the fair value would trend below the longer term path, and thus the buybacks at these cheaper prices would retire more shares, which boosts EPS and per share dividends in future periods, but saves on future total dividend costs. OTOH, the 15% could be an outlier because of the tax reform, for instance. I guess we'll see in a few months. Can't wait to read your next piece! Do you feel your buyback projection is on the low side. You show a reduction of 100 million shares (single quarter) which would cost in the range of $15-20 billion based on current share price and they are still authorize for $70 billion until they reauthorize after March quarter. Wouldn't they maximize their buybacks with such a low share price. Plus most of the 100 million buyback shares is covered by their expected December profit and doesn't touch their cash reserve much. Their share count on their 10-K filling was 4.745 billion on 10/26/18. Apple has $143.365 billion in cash after covering their long-term debt. What do you believe this amount will drop to when Tim Cook says they want to be cash neutral? Anon, I mention above I project $60b spent during the quarter, and I believe that would retire 350m shares (or more if a stock rebound to the $170s and $180s levels doesn”t materialize soon), so yes, my diluted shares outstanding number for Q2 is likely high mainly due to some conservative timing of those repurchases that I’m baking into that figure, an effect that’s rather convoluted to explain succintly and to be honest the basis for doing it could be unfounded, so feel free to come up with your own number. Just to clarify a bit, coming up with the diluted shares out used to compute EPS involves quite a bit more than just reducing the prior quarter’s diluted shares by the number of shares bought and retired. Essentially, there’s three steps or adjustments you need to consider in order to get there: 1) the number of shares issued as employee stock compensation and purchase plan, 2) the timing of the buybacks within the quarter, and 3) the number of potentially dilutive shares added to the quarter average. The share count on Oct 26 provides zero indication into what the Q2 (ending in late March) share number might be (it does inform a little bit about the timing of repurchases made during Q1). What does help quite a bit for Q2 comes from the 2019 Proxy Statement where you’lll find the count updated to 4.73b as of Jan 2. From there you can get a good idea for the figure at the end of March, based on estimated number of shares retired and adding back an estimate for those issued (step 1 above), but again that still can’t be used to compute EPS, for which you’d need the weighted average over the quarter (step 2) in which you’d need to add up each day’s count into a total and divide by 91 days, and finally add an estimate for the potentially dilutive shares (step 3). The adjustments in steps 1 and 3 can be estimated from relatively reliable historical trends and patterns of these values over each quarter for the last 4 years or so, but there’s absolutly no way to infer the timing of purchases, which determines the weighted average adjustment. That’s the main isssue with my estimated 100m reduction in the diluted number despite retiring 350m over the quarter, it’s that timing. In order to control these relatively random timing effects I implemented a sort of algorithm that introduces a conservative bias for how far into the quarter the purchases are made, depending on how the cost per share of buybacks changed compared to the previous quarter. The precise details of it are complicated and as I said this may be throwing the number off without a sound justification. In the case of my Q2 estimate, the algorithm is imposing that the buybacks were centered way near the end of the quarter at only 24 days before the end, which is obviously too late. But it does do what I intended it to, at least directionally. Anyway, I’m still evaluating and experimenting with ways to mitigate the uncertainty of the buybacks timing, uncertainty that seems to rise around big price changes in the stock. Again, try computing your own diluted number but please understand that it’s not as simple as reducing the last quarter by the shares retired. On your second question, I believe what management said they were aiming at, that the cash net of debt would go to zero. The absolute cash and debt levels when they get there is another matter, and perhaps that’s what you meant to ask. I’m modeling those stabilizing at around $75-80b. Thanks for the questions and apologies for the length of my answer. Hope that helps somewhat. Ah, forgot to mention one last detail. The net cash balance as of the end of last quarter was $130 billion, disclosed in Tim Cook’s letter to investors from Jan 2.